SHANGHAI – Chinese authorities say they are trying to track down nearly 100 tons of milk powder tainted with the industrial chemical melamine as the government struggles to prevent a recurrence of the large-scale milk contamination that killed six children and sickened about 300,000 others in 2008. 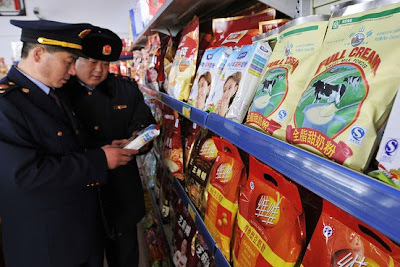 The hunt for the adulterated milk powder, distributed by a dairy company in the northern region of Ningxia, follows reports of other batches of melamine-tainted products across the country in recent months. The government last week started emergency inspections to get contaminated goods off store shelves. China's continuing problems with melamine contamination -- more than a year after the toxic chemical first was discovered to be widespread in baby formula and other dairy products -- highlight persistent shortcomings in the government's efforts to ensure the safety of the nation's food supply, despite stricter regulations. China executed a couple people last year so they could pretend they got the bad guys that sold poisoned milk. Meanwhile more toxic milk sits on shelves, and they don't know where it is. China's keystone cops idea of detective work is to see who dies from dairy products, and then go to the stores they shopped at.